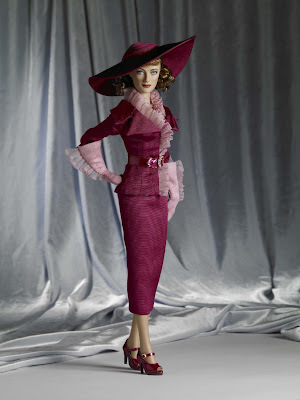 CONTEST: Announcing the first doll released from the Joan Crawford Tonner Doll Collection - Mad About the Hat! This limited edition masterpiece can be yours for free! World renowned doll manufacture Tonner Doll has brought Joan Crawford back to life in a series of detailed and glamorous dolls honoring the Academy Award winning actress. To win the Mad About the Hat doll, simply just answer the five Crawford related questions below and email your entry at the link below. #1 - What three films did Joan Crawford get a Best Actress Academy Award nomination for? #2 - Name three different Academy Award winning actors that costarred with Joan in her film career. #3 - Name three films director George Cukor directed featuring Joan Crawford. #4 - What were the first and last full feature talking motion picture films in Joan Crawford's career. #5 - Over Joan's lengthy career she teamed up with several other actresses. Name three actresses that she costarred with that were considered as her rivals and/or nemesis's. Submit your entry with answers at the email address below. One entry per email address. The winner will be announced on New Years Day, January 1st 2009. Good Luck!